"What we do is take an elevator up, we don't know where we will end up..."
Several years ago I encountered the Black Valley, a small group of experienced voyagers that allowed me to share in their journeys. These were seemingly endless explosions of exploration and discovery held in private, without an audience or any kind of non-participant. If you came, you were a part of the circle. Led by Menlo Mcfarlane, these journeys were absolutely unpredictable yet always dependable in their forceful energy and delicate balance. I travelled many times with this group and these sessions are now locked in time, little time jewels hidden forever in the Akashic records, never to be heard by human ears again. Many years later I had the luck to have Menlo Mcfarlane along with a few other voyagers in my studio and the old spirit of the Black Valley sessions emerged anew. Suddenly those jewels emerged from the past, reforming into new shapes, sounds and words. This time I was able to record the sessions and this CD is the result. Nothing can replace the act of participating in this kind of voyage, but by experiencing these journeys (and possibly working with them in some active way) you may be more prepared for the time when an opportunity comes along. Close your eyes, open your heart and mind and allow the secret chamber of the Black Valley to become a part of your own realm. "Warped random text readings, electronic cellar gurglings, erratically strummed acoustic guitar and fidgety percussion open up this home made disc from California Quartet RFCL. 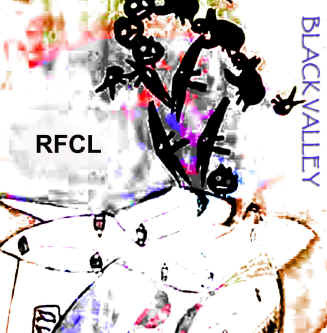 Bulging with ideas, their bruised knuckle playing and unsettling electronic arrangements make Black Valley required listening for old school Residents fans, beat poetry obsessives, loft gurus and appreciators of weirdness."